Today was a ‘big walk’ day. This is to distinguish it from the ‘regular walk’ days that are every day – except on the big walk days – OK clear? So the routine is this. Get up in the morning, have breakfast and then head out onto the sierras and up and down into the barrancas for about 1.5 hours. Jim strikes out ahead in that age-defying way of his, like a nimble mountain goat; Lizzie Lungs plods steadily and stoically behind in an age-defining way, like a mountain goat that’s seen better days. But hey – it’s great. Gets the old cardio-vascular system going, makes us feel deeply virtuous and boy the scenery from up the top is fab. That’s a regular walk day. Big walks happen once a week and the routine is pretty much the same but we’re at it for longer, up more sierras, down more barrancas, totting up the paces on the pedometer, ramping up the heart rate, feeling that muscle burn. Yep, we’re just ultra relaxed about it and having a good time! Sparkling day today so we took a waymarked route from just below the cottage that heads up over the ridge behind and then through the back country of olives and almonds to the village of La Mela. Wide, dusty track that winds around the hills for about 6 km. We passed one farmhouse. An empty world out there and for most of the way there is no sign of human habitation anywhere but plenty of evidence of human hands. Terraces banked with stone walls criss-cross the hillsides. Many of the walls are crumbling and the trees are abandoned, the terraced plots overgrown with scrubby plants that look set to erupt into yellow flower. 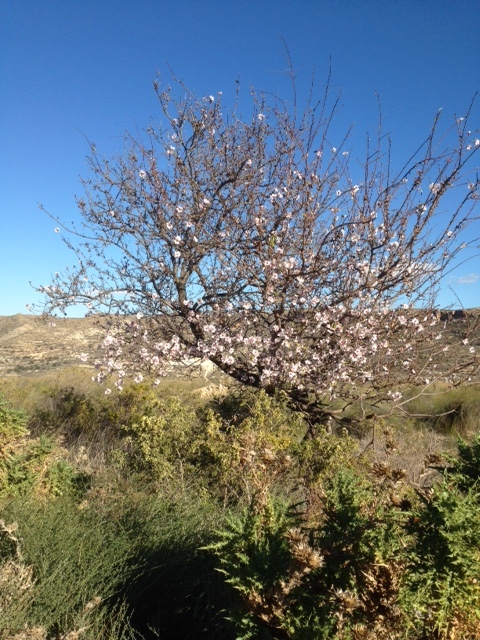 We saw our first almond blossom today; it won’t be long till all the other thousands of almonds lose their winter dowdiness and burst into bloom. That’ll be a sight. La Mela boasts a bar, right on the trail, so we headed there for a couple of cool cervezas and some tiny tapas. “Hola, buenos dias’ I ventured gamely and eagerly to the bartender with my new-found confidence and in perfectly rendered castellano! “Hello, what can I get you” was the reply of the man from Chorley, proprietor of the only bar in town. As we sat outside, sipping our cervezas and munching our tapas a few people wandered into the bar, every one of them English, every one of them assuming we were too, every one of them greeting us in English and we wondered if there’s any Spanish clientele at all.